Yesterday I grabbed a 5' ultralight, 1 1/32oz jig and 2 1" twist tails and checked the area for crappies. I found no crappies. But what i did catch made me alot happier. 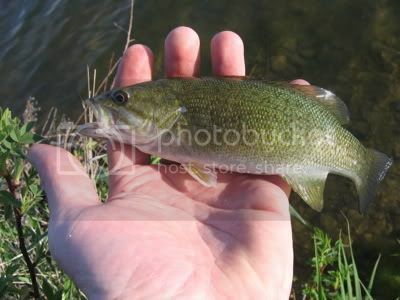 In a few minutes worth of casting I caught 12 smallmouth bass. And they were all this size or smaller. Now, some people would look at that and say "Man, that's one small fish. Are those all you caught yesterday?" Ah, but the educated angler would say "You caught 12 of those in a few minutes!? Man, you're gonna be sitting on a smallie goldmine for years!" Think about that the next time you catch a bunch of small bass. They have parents somewhere. And those parents are spawning right now...thus making more just like him. Ya see where I'm going with this?? ?